We captured the the moment with our stripped-down camera team... although you may find the sound quality dipping in and out. If you were there, let us know what it was like. what a powerful message and great melody ! thanks boys ! It was great to see this after GMA cut it off. Can you Please upload Vertigo at some point. Many fans would love to be able to see and hear the complete show. I saw this song on GMA in NY and it was fantastic, great energy and feeling, you should post that video. I'm an NYU student, but my friend managed to sneak me onto campus the night before the concert. I was so worried that I wouldn't see U2 live, that security would force me out; fortunately, this was not the case. We got up at 4 AM and waited patiently in the cold for nearly four hours, but damn, was it worth it. "Breathe" was the fifth of six songs, and it was great: loud, raw, passionate. The whole concert was amazing, especially considering we were 10 yards away from the band; I just wish U2 had played the title track. Thissong for meit is the best of the album ! I really love this song. Amazing and strong. It will be very good to hear and see the band live playing this song. Be sure that "I will sing, sing a neww song" and it will be live with the band. Cheers from Brazil, Luiz. :D one of my favorites !!! Love this song ,that wasreally good! Thanks for sharing with people who can't see it live. Cheers! arms and cameras down so everyone can see, and just listen to the music. I hope this doesn't happen too much at the U2 concerts. For me, it's all about experiencing the performance in all its subtlety and not injecting my own obnoxiousness loudly so others can't see or hear well. Must be hard work banging out the hits, let alone the new material on a promo tour inthe cold . . . great song and I can see this being a big hit down the track and a concert staple. I really liked the camera work which put the crowd at the centre of the action. Keep posting them - subscribers have already gotten their money's worth! I WAS THERE... 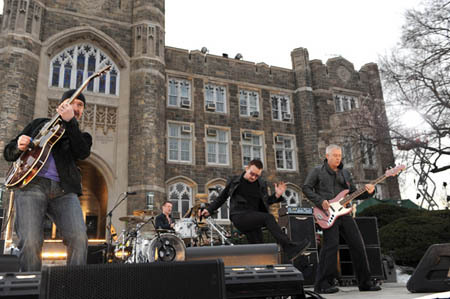 It was an AMAZING performance and showed once again to me, the power of a U2 song performed live. I loved the song on the album... but hearing it LIVE puts the breath of live into "BREATHE" Now I can't listen to that song unless the volume is at 11. And I can't lie..... I'm not a student at Fordham... but in the admonition of Father McShane.... I will tell my kids I was there! Thank you U2 for that little masterpiece which has now become my favorite song on the album.